A spa date brought CC and me to Davie Street. For dinner we decided to be spontaneous and picked whatever that caught our eyes. 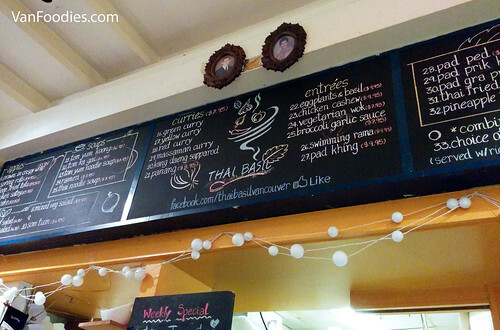 We ended up at the door of Thai Basil on Thurlow. We started with a Thai Iced Tea each. 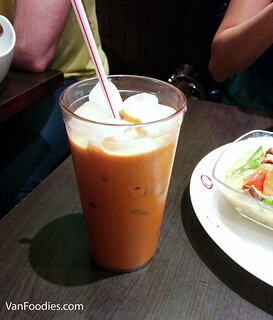 It has the essence of the HK style milk tea but sweeter due to the use of condensed milk. It was quite good, had a good blend of tea flavours, thirst-quenching and surprisingly refreshing. But I felt like my blood sugar level went up just by drinking this. Then we shared two entrees. 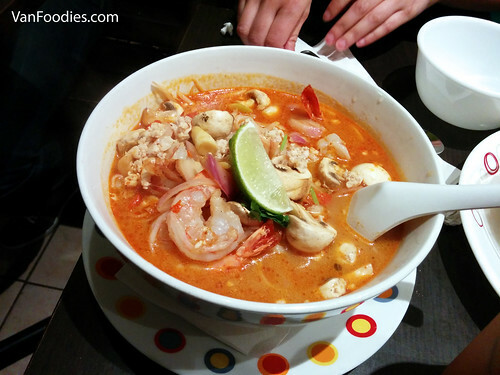 The Tom Yum Noodle Soup builds on the classic Tom Yum soup base, but not as sour and spicy as I have had at other Thai restaurants. It used the same type of rice noodle as Pad Thai, so the texture remained al dente and not mushy. It was a big bowl of noodles, with a decent serving of shrimps. This definitely satisfies the cravings for soup and noodle soup, killing two birds with one stone, and would be good for a chilly fall/winter day. The Kang Daeng Sapparod Curry is a specialty red curry. There was a lot of sliced beef in the sauce, along with diced pineapple and asparagus. It wasn’t as spicy as the regular red curry thanks to the sweet pineapple chunks, but it still gave you a hint of heat. The sauce was a little thin but it wasn’t too bad. I would get this again except I wouldn’t suggest ordering the combo option. For an extra $2, the combo includes rice, a spring roll and a side green salad but the bowl of curry shrinks by about half. We saw the generous serving of the regular curry bowl and got quite disappointed when we got our combo plate. If you don’t care for the green salad and spring roll, you’d be better off just ordering a curry bowl, then an order of rice on the side. The restaurant is not very big, sits about 20-24 people including the outdoor seating. Grab a seat wherever available, but you will have to order over the counter and they will bring the food to you. You can also choose to pay upfront or at the end of your meal. It was 9pm on a Saturday night and the restaurant was full of dine-in customers as well as take-out orders. Even though they were swamped, the staff remained friendly and continued to offer speedy service. $7.95 for a curry bowl again? Yes, please! 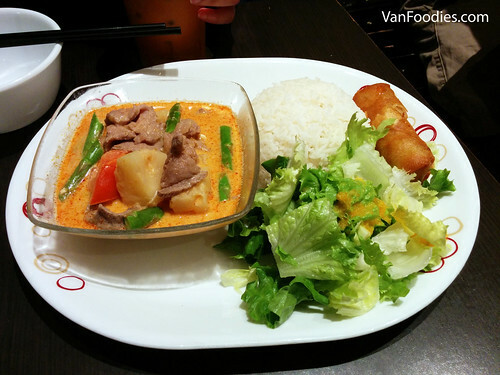 The food was actually quite good and the price is very reasonable for Davie Street. If I’m in the area, I’d definitely go back to try other things. Just need to be mindful about the potential wait for a table, and maybe not getting the combo option.